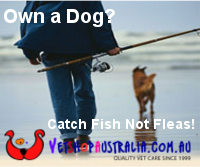 FishMax - THE Australian Online Fishing Magazine: Travelling to Queensland to Fish? Queensland is one Australia’s greatest fishing locations, with fantastic locations right across the coast that provide not only a great catch, but a great atmosphere for long days on the rod. Located north of Brisbane, World Heritage listed Fraser Island is the world’s largest sand island and features some 40 lakes. 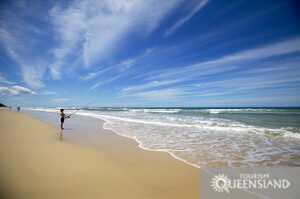 For anglers, Fraser Island is best known for the northern run of tailor which occurs between July and October. Large schools of tailor can be located by looking for circling sea birds and the distinctive ‘boiling’ water action that large schools of tailor produce. If you have a 4wd and want to find yourself some cheap accomodation , you can always opt for camping, one of the best ways to enjoy Fraser. On Cape York Peninsula, Weipa and nearby Albatross Bay offer excelent shallow water inshore angling for barramundi, , mangrove jacks, flathead, estuary cod, queenfish and trevally. The Wenlock River further north is famed for huge barramundi. At the tip of the peninsula, around Cape York, there are many deep drop-offs and reefs where coral trout and golden snapper can be found. In Townsville, Cleveland Bay has large mangrove areas, especially around creek entrances. Fish these areas for mangrove jacks and barramundi. Try the main boat harbour in Townsville for bream, flathead, whiting, trevally and barramundi. The Ross River holds plentiful fish species and is best fished at low tide. Around the tourist hotspot of Hervey Bay is more great fishing, for coral trout, red emperor, parrot fish, pink snapper, sweetlip, trevally, cobia and mackerel. 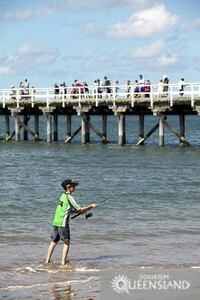 For shore fishing, try Urangan Pier. 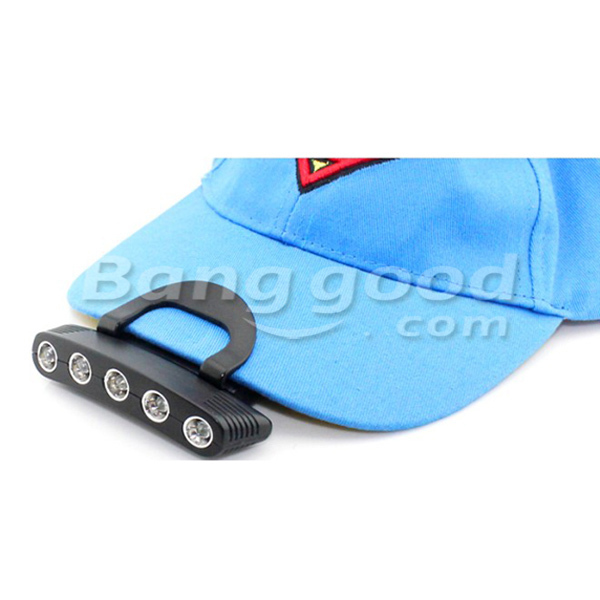 Fish in winter for bream, tailor and dhufish, and in spring and summer for flathead and whiting.